Sorry but this combination does not exist. Give freedom to choose his knife or kitchen knives. The gift voucher allows you to offer a good amount of purchase that you want. On our website, a package for the port is automatically charged. This amount will be added to your gift certificate. 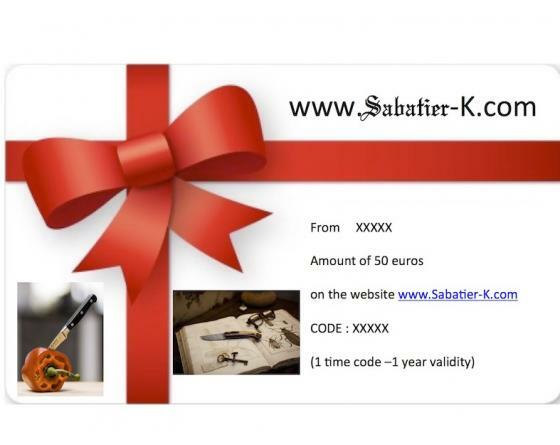 You order a gift voucher of 50 euros. You will receive a check for 56 euros with a UNIQUE code in the form of a PDF document which you can give to the person of your choice. The happy owner recevera that the gift will be able to choose the items that ferront her happy throughout the www.sabtier-k.com site. It then needs to do is place the order online, and by entering the voucher code when ordering gift, the value of the gift certificate will be automatically deducted from the purchase. Here you will find all the answers to the questions you ask yourself.